Ernest Donald (also known as Ernst Donald) is of particular importance in that he was one of the very early people to take photographs in Aberdeen and it is likely that a portrait taken by him is the earliest surviving example of a portrait taken in that city. He may also have been the first person to have a permanent studio in Aberdeen as a retrospective article dated 1905 mentions that Ernest had a studio in Rose Street which, incidentally, is just around the corner from where he lived in Thistle Street. Unfortunately, he does not appear to have advertised his business in the usual trade directories. 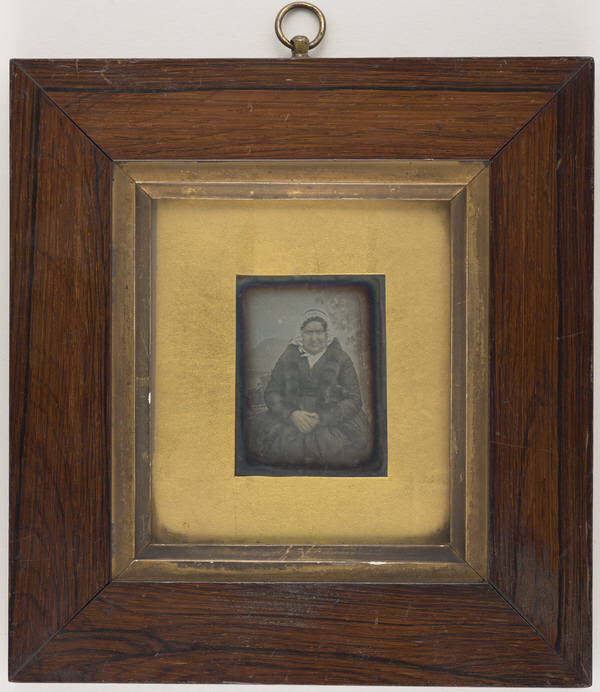 Ernest operated as a daguerreotypist from just before 1850 until about 1857 by which time he was recorded on his daughter’s birth certificate as a ‘provision curer’. An itinerant photographer, Mr. Blackwood, has been identified as visiting the Mechanics Institute in Market Street, Aberdeen as early as 1846 (see ‘A Faithful Likeness’ by Bernard and Pauline Heathcote) and at least four more itinerant photographers advertised prior to 1850. 1871 – aged 49 – living 5 Short Loanings, Old Machar, Aberdeen with his wife and four daughters. Ernest is described as a ‘clerk and collector’. His daughter Isabella is described as an assistant photographer. Ernest Donald’s grandfather, Thomas Gordon was a parochial schoolmaster, as was his father William Gordon who died in 1794 in his 75th year. William had been a teacher for over 50 years and parochial schoolmaster at Monymusk for 32 of these years. After the death of William Gordon, his son Thomas became headmaster and remained at Monymusk until 1798. Thomas died at Daviot in 1811 where he had been parochial schoolmaster at Daviot since 1798. There can be no doubt that Ernest totally understood the importance of a good education – and that this had been instilled in him by his parents and as a result he became very involved with the Mechanics’ Institute in Aberdeen. Ernest Donald’s parents. Ernest’s father, James Donald (? – 1842), was a tailor in Aberdeen. His parents, James Donald and Mary MacLeod Gordon (1794 – ?) married in Aberdeen on May 25th, 1817. Ernest was the second eldest of six children in the family. His siblings – Charles Donald, Helen Donald, William Gordon Donald, George Donald and Andrew Glennie Donald – were all born between 1818 and 1830. Mary died before 1841 and James died in 1842. Her parents and some of her siblings are buried in the kirkyard at Daviot, Aberdeenshire. It is a possibility that she may be buried there also, but no burial records exist for this parish. 1822 No parish baptism entry has been found for Ernest Donald except for a record in the Mormon Church called the Baptism for the Dead in the Temple of Saint George. 1841 According to the census Ernest Donald was living with his uncle Charles Gordon and his family in Dee Village, Old Machar, Aberdeen. Charles Gordon was a self-employed cooper and provision merchant (the firm of Charles Gordon and Sons continued to operate well beyond the death of Charles Gordon in 1872). 1845 On February 20th, Ernest Donald and Elspeth Grant were married by the Reverend David Simpson, Minister of the Free Trinity Church in Aberdeen. 1845 Ann Gordon Donald, first child of Ernest and Elspeth, was born on September 20th. 1846 Ernest Donald was associated with the Mechanics Institute in Aberdeen. He donated a book, John Lindley’s, ‘Vegetable Kingdom’ to the Mechanics Institute Library (Aberdeen Journal December 9th 1846). 1846 Ernest worked for his uncle, Charles Gordon, as a pork curer at 57 The Green. Ernest and his family were living at Thistle Street. He continued to appear at these two addresses in the Scottish Post Office Directory until 1850-51. 1847 Ernest was on the Committee for the Mechanics Institute. 1849 An article appeared in the Aberdeen Herald and General Advertiser on Saturday 6th January reporting on the first annual supper of the Aberdeen Eclectic Society – a literary society – over forty people attended the supper. Ernest was President of the Society. ‘A somewhat novel feature in connection with the supper was, the entire exclusion of intoxicating drink’. 1849 On Wednesday January 10th, a soiree was held at the school room in ‘Whitestripes’, the proceeds of which were to be given for the purpose of establishing a library in that district. Several ‘addresses’ were given during the evening, including one from Ernest on Natural History. 1849 Isabella Grant Donald, was born on the 15th July – a second daughter to Ernest and Elspeth. 1850 The Aberdeen Eclectic Society held a soiree at the Mechanics Institute. Several addresses were given during the course of the evening, including one on ‘The Sublimity of the Stellar Universe’ by Ernest Donald. Later that same year, Ernest was Chairman at another event by the Society held at the Mechanics Institute to honour John Levie who was leaving Aberdeen. 1850 Ann Gordon Donald, Ernest’s first-born daughter died at the age of five, and was buried on October 10th in St. Peter’s Cemetery, Aberdeen. 1850-51 The Post Office Directory listed Ernst (sic) Donald as a daguerotypist (sic) at 57 The Green, Thistle Street, Aberdeen. 1850 or thereabouts In 1905 an article in the East Neuk Chronicles (p83-84 under the heading Old-Time Periodicals) by William Forbes Skene read: ” I remember one of the first Daguerre typists in Aberdeen; Ernest Donald, in Rose Street. The actual date is not stated but investigations are ongoing. 1851-52 Ernest’s business address was recorded as 57 The Green in the 1851-52 Post Office Directory – the same address that he worked from with his uncle Charles Gordon. 1851 The Aberdeen Mutual Improvement Association held its anniversary soiree. 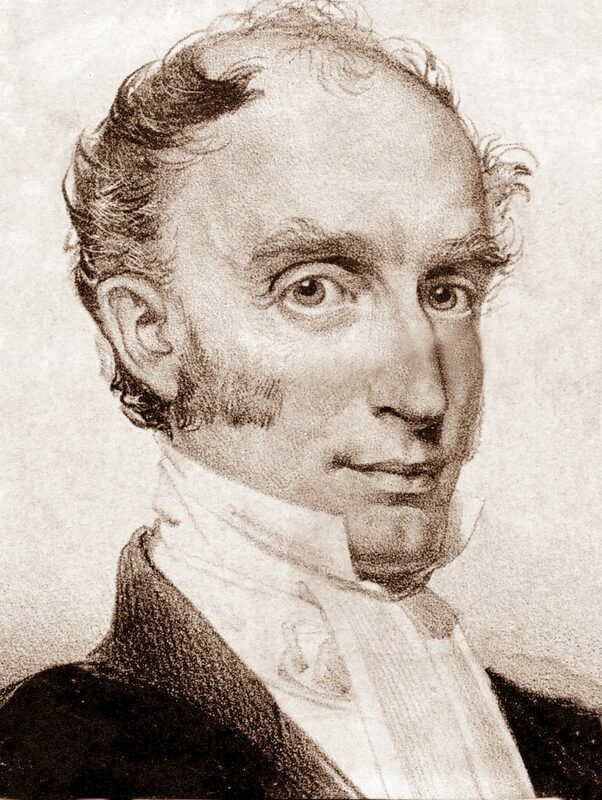 Ernest Donald was called to the chair and opened the meeting with a few appropriate remarks in which he illustrated practically the advantages accruing from such associations (Aberdeen Journal 8 January 1851). 1851 A portrait entitled ‘Unknown Woman’ was created by Ernst Donald on 17th February 1851. This photograph is now part of the permanent collection at the National Portrait Gallery of Scotland and was gifted by Mrs. Riddell in memory of Peter Fletcher Riddell (1985). 1851 This was the first census showing Ernest as being a daguerreotype artist. Ernest and his family were living at Thistle Street. Ernest was 29 years old. 1851 Ernest was a director or committee member of the Mechanics Institute in Aberdeen. 1851 On December 31st the Aberdeen Mutual Improvement Association met; Ernest being President, he gave ‘an able and appropriate address’. 1852-53 The Post Office Directory for Aberdeen recorded ‘Ernst Donald’ as a daguerreotypist at 34 Thistle Street. 1853-54 The Post Office Directory for Aberdeen this time recorded Ernest Donald as a daguerotypist (sic) at 34 Thistle Street and the Cornwall’s New Aberdeen Directory listed ‘Ernst’ Donald as a photographic artist, also at 34 Thistle Street. 1853 A third daughter was born to Ernest and Elspeth on the 19th March and was named Ann Gordon Donald; the same name as their first daughter who had died three years earlier. 1853 Ernest was re-elected to the committee of the Mechanics Institute at the Annual General Meeting along with numerous other members. 1853 – A photographic exhibition was held at the Mechanics Institute in Aberdeen. The exhibition was open from December 4th to December 12th. Ernest was recorded as entry No. 207 “Collection of 12 Daguerreotypes by photographer Ernest Donald”. Cost of admission to the exhibition was sixpence. The Photographic Exhibition was extended due to public demand. There were five categories – Daguerreotypes, Calotype Portraits or Landscapes, Collodian Portraits on Glass, Collodio-Calotype Portraits, and Collodio-Calotype Landscapes. 1854-55 In the Directory for the City of Aberdeen, Ernest Donald was described as a daguerreotypist at 34 Thistle Street. 1854 At a meeting of the Mechanics Institute held in June, Ernest’s, who was then 32 years old, was mentioned as a photographer. He was also an auditor at the meeting on that occasion. 1855-56 The Directory for the City of Aberdeen listed Ernest Donald as a daguerreotypist from 34 Thistle Street. 1856-57 The Aberdeen Post Office Directory again described Ernest Donald as a daguerreotypist related to 34 Thistle Street. 1856 Ernest was the informant on the death certificate of his brother in law James Grant, at ‘Strondow’, in the parish of Knockando, Morayshire. 1857 Jane (referred to as Jean on her birth certificate) Gordon Donald, a fourth daughter, was born to Ernest and his wife Elspeth on July 22nd. 1857. Ernest was shown by now as a ‘provision curer’. 1860 Ernest was strongly religious as his Scripture Text Book shows. His widow carried it all the way to Australia when she emigrated after his death. In it Ernest recorded about 70 pages of shorthand notes taken in church from April 1860 to April 1862. Amongst these was the sermon on the 26th August given from the Old Testament 1 Samuel by the Reverend David Simpson. 1861 The census in 1861 shows that Ernest was aged 39 and was living at Short Loanings, Old Machar, Aberdeen with his wife and three daughters. His occupation was recorded as ‘Clerk to a Hide and Cattle Salesman’. He appears at that time to have given up photography as a living. 1864 A fifth daughter, Helen, was born on April 6th 1864. 1871 In the census, Ernest, aged 49 was living at 5 Short Loanings, Old Machar, Aberdeen with his wife and four daughters. Ernest is described as a ‘clerk and collector’. Interestingly his daughter Isabella is described as an assistant photographer but it is not known who she assisted. 1872 Isabella Grant Donald, Ernest’s second daughter, married William Duguid (stone polisher), at her parents’ home at 5 Short Loanings. 1874 approximately This is the only known portrait of Ernest Donald which was found in the family home many years after his death. 1876 Ernest, at the age of 54, was a clerk to Mr. Duncan, a cattle salesman in Aberdeen. He was called as a witness at the trial of two men who had been accused of the theft of sheep from two farms and was able to identify the men. (Banffshire Journal and General Advertiser – 3 October 1876). 1877 Jane Gordon Donald, fourth daughter of Ernest and Elspeth, died at 9 Short Loanings on April 15th from phthisis pulmonalis (tuberculosis of the lungs with progressive wasting of the body), and was buried in St. Peter’s Cemetery four days later. She was only 19 years old. 1877 In the early hours of July 29th a fire swept through Short Loanings. 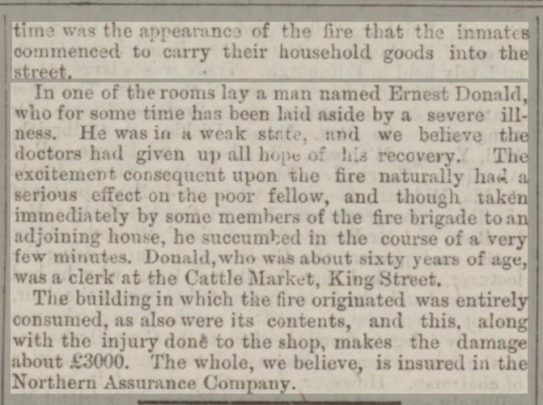 Ernest Donald, already a very weak and sick man suffering from pneumonia, quickly succumbed from the effects of the smoke. His daughter Ann was with him when he died. He was buried on August 2nd at St. Peter’s Cemetery alongside his daughter Jane. 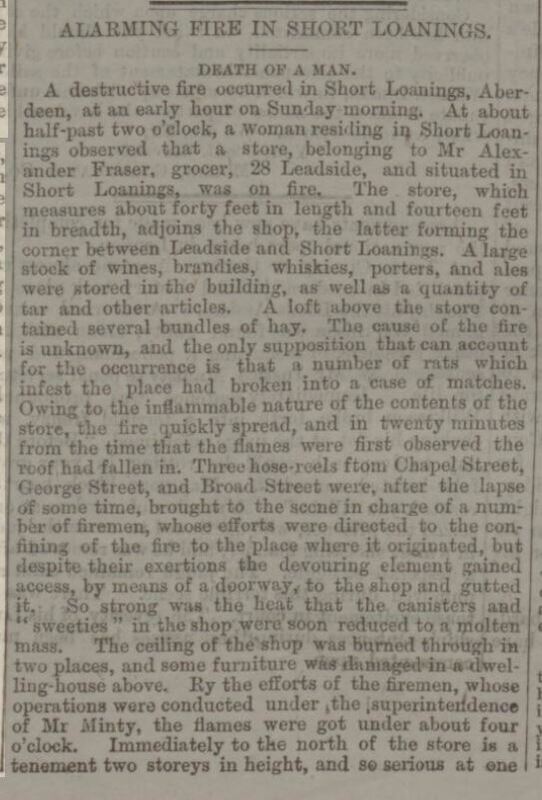 1877 The Aberdeen Weekly Journal on Monday 30 July included an article which mentioned the destructive nature of the fire at Short Loanings in the early hours of the previous morning in which the building where the fire originated was entirely consumed. “In one of the rooms lay a man named Ernest Donald, who for some time had been laid aside by a severe illness. He was in a weak state, and we believe that the doctors had given up all hope of his recovery. The excitement consequent upon the fire naturally had a serious effect on the poor fellow, and though taken immediately by some members of the fire brigade to an adjoining house, he succumbed in the course of a very few minutes. Donald, who was about sixty years of age, was a clerk at the Cattle Market, King Street.” Ernest was, of course, less than 60 years old. Elspeth, his widow, took in a boarder and a lodger in an effort to make ends meet and she worked long hours as a laundress. 1878 Ann Gordon Donald, Ernest’s third daughter, married Peter Jamieson (brass finisher) at her parents’ home at 9 Short Loanings. She was 25 years old. 1879 Ann Gordon Jamieson (nee Donald) died on 31st July 1879, after having given birth to her only child, William, three months earlier. Tragically, William died on November 13th from chronic bronchitis and was buried with his mother in St. Peter’s Cemetery, Aberdeen. 1881 In the census, Ernest’s widow Elspeth was still living at 9 Short Loanings with her daughter Helen and a boarder and a lodger. 1885 Ernest’s second daughter Isabella Grant Duguid (nee Donald) died on the 23rd August 1885 at Exeter from ‘acute general tuberculosis’. She was only 36 years old and had six children, the youngest not quite three months of age. 1885 Helen Donald, youngest daughter of Ernest and Elspeth, married Peter Fletcher Taylor, a cabinetmaker, at her mothers’ home at 9 Short Loanings on 27th November. Peter Jamieson, widow of Helen’s sister Ann, was one of the witnesses. 1886 Helen Donald and her husband Peter Fletcher Taylor, left Scotland and emigrated to Australia on ‘The Jumna’ which was bound for Brisbane. Ernest’s widow, Elspeth (she was listed as Elizabeth) went with them. She significantly altered her age to emigrate – perhaps fearing that she would be not accepted and thus separated from her only surviving daughter. She would have been in her early 60’s when they emigrated, yet her age was recorded as 46. The ages for Helen and her husband Peter were recorded correctly. Helen was the last surviving child of Ernest and Elspeth and she died in Brisbane, Queensland, Australia on her 84th birthday. Helen and her husband had six children, five of whom survived to a ripe old age. One of her sons, Harry Taylor, was awarded an MBE (Member of the British Empire) for services to the Queensland Ambulance Transport Brigade in 1972. 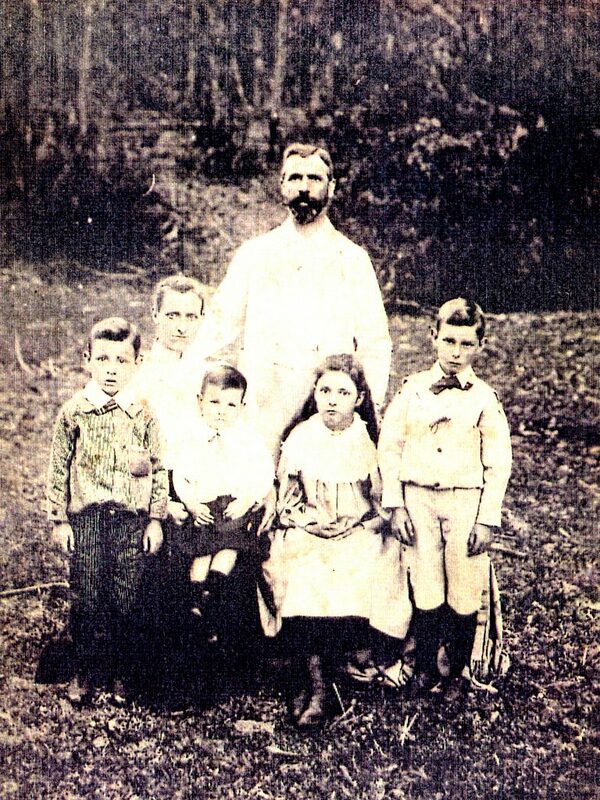 1896 approximately Below is a picture of Helen Donald taken in Australia with her husband Peter Fletcher Taylor and four of their six children; (from left to right) James Taylor, Lewis Taylor on his mother’s lap, Annie Taylor and Charles Taylor. Lewis Taylor was born in August 1894. 1910 Elspeth, widow of Ernest Donald, died in Brisbane, Queensland, Australia on the 25th April and was buried at Toowong Cemetery, Brisbane on April 26th. 1948 – 6th April – Ernest and Elspeth’s last surviving daughter, Helen, died on her 84th birthday, and was buried with her husband at Toowong Cemetery. This closed the chapter on the immediate family of Ernest and Elspeth. Ernest Donald and Elspeth Grant have descendants living in England and Australia. Only one example of Ernest’s photography is known and is shown below.